We live in a time when the earth is stressed: fires blaze along the West Coast, resources are dwindling, and the ocean and its inhabitants are diseased by plastic. The state of our planet raises questions. How does our own condition reflect this? What is the pathway to healing the earth? And can our own healing lead to the consciousness required to heal the earth? Is healing the earth even separate from our own healing? I’m a Yoga for Scoliosis specialist from New York City, and on July 27, 2018, as the moon became full, 17 women converged on the radiant and pristine Salt Spring Island, BC, Canada, to create our own space for healing, consciousness and connection through a workshop on Yoga, Scoliosis and the Organic Body. This was the third workshop I’ve taught in the Canadian Northwest. It was my dog’s vet who told me about Salt Spring Island on my first visit to British Columbia, when I taught in Black Creek on Vancouver Island. She told me that Salt Spring Island’s rockbed consists of a high percentage of crystal and that I should visit its beautiful forests, lakes and organic farms. After a visit, I chose Salt Spring Island as a special place for all my future retreats in British Columbia sponsored by TOPS. The atmosphere is uniquely crystalline, bright and uplifting. Organic farms proliferate—there has even been discussion about certifying the entire island organic! This past summer, the retreat consisted of all women of all ages. Most participants had scoliosis, or they were teachers wishing to learn more for their students with scoliosis. A number of them were local or from BC, and others came from New York, Philadelphia, Nova Scotia, Idaho, and Arizona. There were also some of my students in attendance, and others I had met on the two previous Canadian retreats. Five had surgical spinal fusions. As women with scoliosis, we all share a tendency to sink. As the spine curves and spirals, we drop: our bones, our abdomens, and our organs. Aging and hormones add to this, as does extra weight on the body, bone and/or disc degeneration, and joint compression. Our organs suffer, as they also become displaced and compressed as a result. How can we find the lift and space our organs need to function well? Everyone knows where their arms and legs are, but perhaps not exactly where their liver and stomach are located. How high up are your lungs? How can you feel your kidneys? In order to sense how one’s scoliotic patterns may be impinging on the organs, one has to know where one’s organs are. 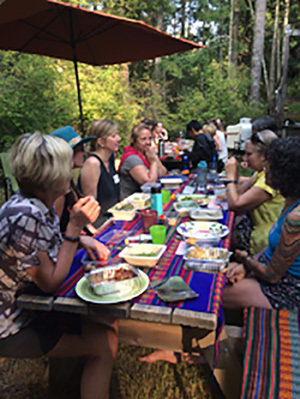 We began with a warm, friendly, vegetarian and gluten-free first dinner on the lawn of our host Robbyn Scott’s Antler Ridge Studio. There, we all got acquainted at picnic tables surrounded by forest, birds and deer. After dinner, we embarked on a two hour study of organs anatomy. I know everyone learns differently. My sieve-like mind could not digest the most basic anatomy during my teacher training, and I continued to struggle with it for years afterwards. So when I teach organs anatomy, I use every method I know might help. We started by looking at pictures. The organizing principle for our study was that the diaphragm is the central horizontal axis dividing the “organs of inspiration from the organs of digestion and reproduction” as BKS Iyengar put it, and crossing this horizontal axis, the digestive system is a vertical tube that runs down the central axis of the body. We colored in these structures with colored pencils - one of my favorite activities of all time. Then we palpated our own bodies to sense the location of the diaphragm at the bottom of the ribcage. Next we traced the pathway of the digestive system with our hands, and then felt it in a different way with a sip of cool water. We also identified organ placement on the life size skeleton in Robbyn’s studio. Yoga postures, called asanas, reveal imbalances in the body. Therefore, when we look for balance within an asana, it takes us to a place where practicing movement with intent has a stronger effect on the body than the effects of our unconscious habits. Saturday morning, students looked at one another’s scoliotic patterns and determined which organs might be most impacted by them. Sensing one’s own patterns in awareness-based poses like Puppy Pose and Tadasana (Mountain Pose) at the wall, we sensed from exterior feedback where compression was likely. How can the connection of the arms to the shoulder sockets help to lift the weight of the ribcage off the low abdominal organs? How does lifting the legs help to support them? Does the movement of the arms and shoulder girdle affect the lungs and heart? These questions are answered with simple practice techniques, like squeezing a block between the thighs and stretching one arm out to the wall in a Vasistasana (Side Plank) variation. That by studying the organs, one can come to the conclusion that the body is not symmetrical even for people without scoliosis. Years ago, when I took Karin Stephan’s Advanced Studies Course in Yoga Therapeutics in Cambridge, we began the course by talking about the fact that with the organs, physical bilateral symmetry is an illusion. The kidneys are on different planes, the lungs are different sizes, and directly below the diaphragm - although located in balance with each other - the stomach and the liver have completely different qualities as well as sizes! Our outermost layer is the skin, and our innermost layer is the bones. These two layers create another assumption of bilateral symmetry, but real balance is found in creating an optimal environment for our organs—and that environment can be symmetrical or not. What organs need the most is space and movement - both intrinsic and external. Working with the organs gives us new ways of sensing the body. For example, when those of us with scoliosis line up the ribcage by sensing the levelness of the diaphragm, that is a completely new reference point, which is more internal and precise than working with the boney asymmetries of the scoliotic low ribs. Another example is when we use the lungs to expand the ribs where they are compressed, we balance the use of the lungs, and change the shape of the ribs. When we practice postures that encourage the vertical actions of the kidneys, we move out of actions that exaggerate postural patterns such as the hyperlordosis of the thoraco-lumbar area, instead creating length and strength there. These actions also support the kidneys themselves. Throughout the weekend, we followed this theme of filling our concavities with organic support and lifting the organs where we drop. And then there’s the last benefit from this deep internal work: change and healing. Sunday was focused on restorative yoga and the low abdominal organs, including the ovaries, uterus, and bladder. Years ago, I suffered from two very large ovarian cysts from endometriosis which had created adhesions all through my intestines and bowel. I shrunk the cysts with yoga poses specifically for this condition, thus avoiding a hysterectomy. The larger cyst was on the left - the side of my thoraco-lumbar concavity - and had been there (in a smaller form) since I was 24 years old. I understood this was not a coincidence; there was a direct relationship between my scoliosis and where my medical problem began. Many of the other women had found these types of relationships between other organs, such as one person’s digestive problem that was related to the iliocecal valve and her lumbar curve pattern. By combining Iyengar therapy poses for women, along with modifications for scoliosis, we worked with Prasarita Padottanasana (Wide Legged Forward Bend) over a bench and bolster with lots of support under the low abdomen for the organs, and a little extra padding under the lumbar concavity for the scoliosis. We also experienced Supta Baddha Konasana (Supine Bound Angle Pose) on a 4 block “sling” allowing the sacrum and low organs to rest downward. All the therapeutic set-ups allowed flow through these organs as well as rest for the nervous system. Keeping in mind it was a full moon on that day, a number of women menstruated. Two of them thought they were post-menopausal, so that was a surprise! 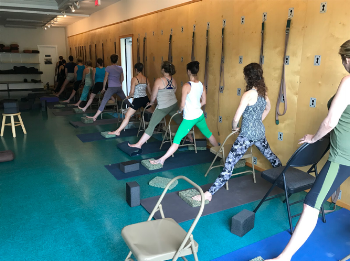 Therapeutic asana are powerful, and this type of organic support - specifically allowing the pelvic organs to move back toward the spine - can re-stimulate life energy and flow. So why travel all the way to Salt Spring Island for this? The herbalist and author Stephen Harrod Buhner has pointed out that the brain of the tree is its subterranean roots, and the movement of the tree is from the canopy. Similar to the organs in our trunk, movement is caused partially by external forces. But also like the organs, the tree has its own internal movement as well. 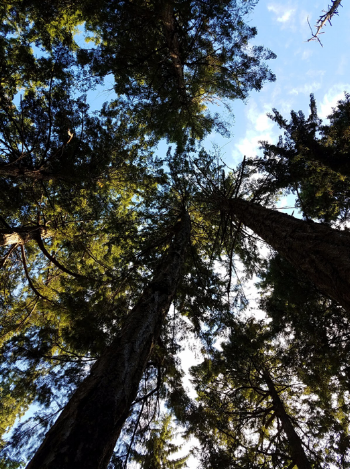 According to Peter Wohlleben in The Hidden Life of Trees, no one really knows how trees pull the water all the way up their trunks to bring nutrition to the top of the tree. In yoga, when we practice Sirsasana (Headstand), we lift with our legs and tail to pull up the spine and the fascia surrounding the brain, even though the skull presses down. Upside down, the digestive tract lifts up like the energy of a tree. As yoga changes our perspective of our bodies, we truly relate to our fellow inhabitants of the earth. In New York City, a place I love, and where I have lived for decades, my daily yoga is practiced somewhere between four to twelve stories off the ground. Visiting Salt Spring Island gives me a chance to practice close to the earth—closer to the deer, the trees with their curved trunks, and the lakes. Practicing poses like Tadasana (Mountain Pose), Chatoosh Padasana (Four-footed Pose), Vrksasana (Tree Pose), Viparita Karani (Inverted Lake Pose) remind me to ask whether I am on this earth, an inhabitant of it, or whether it somehow inhabits me. The Organic Body practice allows me to ask whether I need to support my organs, or whether they support me. Like my natural surroundings, the need to explore the organs, in a quiet place with a quiet mind, reminds me that there is a whole inner world in which I can spend my life watching and studying. During the retreat, we practiced a variation of Stump Pose. -Place a horizontally placed block, horizontally rolled blanket (or if you are fused, a narrowly folded hand towel) under your low shoulder blades. -Place your head on another block or prop similar in height to your other prop. -For balance, place a small face cloth or scoliosis pad under your thoracic scoliosis concavity on top of the block, blanket or towel. Your heart is located directly behind your sternum and is enveloped by your lungs. With the help of the gentle extension over the back prop, the heart lifts and stretches, and you will experience a quiet rush of energy. Practicing this during the retreat, in a room full of new friends, we felt our connection with each other and the energy in the room. This connection flowed out to the trees, the animals, the whole forest, the whole earth; the universe. Arms help to lift the heart. Visit Deborah Wolk’s website: Samamkaya Yoga.